Agreed, that's needed. Doesn't give _much_ range variation, though )-:. So _isn't_ what's needed; however, is probably all that's available. (so text uses more pixels). Hmm. Not sure I'd call that a resolution (-:. higher or lower, interpolation gets used in painting the screen objects. I think we're all agreed on that one. up the size of the text. that adds only 150% and 200%; IIRR, XP didn't even have that option. the sales flyer next to the monitor that it had 0.36 mm pixel size. Geez, no wonder it was so fuzzy. be one large circle or rectangle. granularity. The larger the pixel pitch, the less of them per inch. dots per inch (with a larger number meaning higher resolution)." to read for those having a tough time reading tiny characters. and then up the DPI setting in Windows. 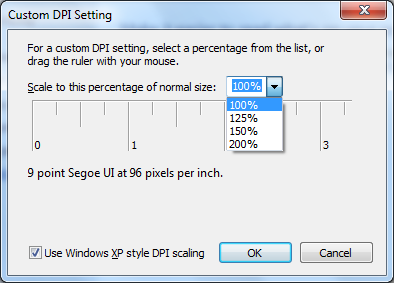 DPI), or 200% (192 DPI), or you can use a slider for a variable DPI. That's the same slider and drop-down list dialog that is in Windows 7. There are LOTS of settings for DPI. character by upping the DPI. of the OP's Microtek 815c LCD monitor. monitor reports to Windows for its specs (if you're using HDMI). AC must be "pure". You can't have any DC at all in it. If it isn't pure AC, the tube will die a premature death. You only get a 25000 hour life, with high quality drive. but, is that enough ? was loose, that could destroy the inverter. can always fail on those and destroy them. book on the topic of care and feeding of CCFLs like that. with a background in optics. choice, he'd go for bigger. room - with a ballpoint pen, and with a big marker pen. look fuzzy anyway, it may matter less. size hence a smoother character. _did_ let me set more than 200%: up to 500%, I think. case) then more pixels are available per inch. required (analogue - like [S, X]VGA - or digital). Exactly. _Not_ what Ken wants. changes size. I found I could also type in the 500.
the first) does look very like the W7 one. filament bulbs; most modern ones do indeed use lots of white LEDs. the "vintage" of the driver, there is a "zoom" solution. Older NVidia driver kits had "NView". I don't see "NView" in my Win10 install. I do see it on my WinXP install. We don't know what video card brand the OP has got. albeit with a different name. "Zoom" sounds good to me.